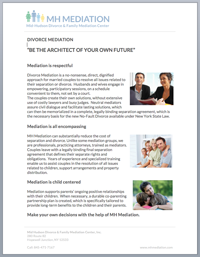 The process of reaching an agreement through mediation has many applications in everyday family and business life. Whether your organization includes individuals who might themselves encounter conflict or divorce, or employers whose employees may ask for advice, or people whose friends might look for guidance, we can introduce your membership to alternatives to using the court system to resolve problems. Our mediators are available to present an interesting talk to business and social groups. If you are interested, please contact us.